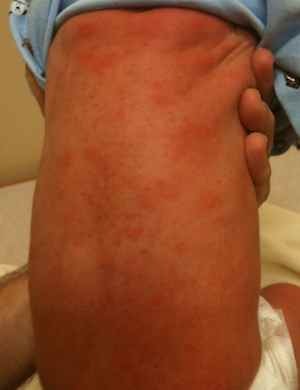 Erythema Toxicum Neonatorum (ETN) is the worst named rash in pediatric medicine. It is an innocent rash that is the farthest thing from “toxic”. ETN presents as yellowish bumps with surrounding redness in newborns. Many parents think they look like insect bites. They can appear anywhere on a newborns body and will often move around. ETN resolves without treatment in 2 to 3 weeks.